Bobby Lashley now has all the gold. Aron Rex is talking to Billy Corgan and Dixie Carter when Lashley gets in his face then walks on by. James Storm heads to the ring and calls out Brian Hebner. Hebner points out that he didn’t do anything wrong. Still, Storm wants a rematch right now. Billy Corgan heads to the ring. Corgan says that the ref’s decision is final. Storm, still grasping at straws, says the people want a rematch. Corgan says that Storm is begging and that maybe he can’t “win the big one.” Storm grabs a hammer from under the ring to illustrate the point that he “built” the company. Security enters the ring. Storm gets in Corgan’s face, then he smashes one of the security guards over the head. He then threatens Corgan before he leaves the ring. As Storm walks up the ramp, Corgan tells him that he is indefinitely suspended. Mike Bennett (with Maria) says that Moose is his “game-changer.” With Moose at his side, he’s on his way to the World Title. James Storm is escorted out of the Impact Zone. Pretty good match. There were a couple of moments where it seemed to slow down strangely, but overall it was fine. Edwards seemed to do most of the work. Maria tells Allie and Jade that Gail Kim is going to have the worst night of her life. Jade says she won’t play by Maria’s rules, so Maria tells her that if she loses, then she will never get another shot at the Knockouts Title. This was a good match until the end. Jade had a lot of good strikes and showed her strength in an impressive (though ill-advised) spot where she caught Gail Kim diving to the floor and drove her knees into Gail’s midsection. It was a nice, competitive match, but it was marred by Earl Hebner getting unrealistically in the way during an awkward pin attempt. After the match, Sienna attacks both Gail Kim and Jade. Maria then comes out and says that Gail Kim won’t ever get a chance at the Knockouts Title. Lashley approaches some of the X-Division guys and acts like a prick. This was a pretty fun match. There were a ton of unnecessary movements and flips, but it made for a frenetic, enjoyable match even if there wasn’t a lot of depth to it. EC3 is in a predicament. Dixie Carter questions Corgan’s actions. She suggests that they focus on Lashley. Corgan agrees. EC3 calls out Drew Galloway so he can answer his challenge from last week. Galloway thinks that he already knows EC3’s answer: “no.” Instead, EC3 accepts the challenge. As soon as he accepts Galloway’s challenge, Aron Rex heads to the ring. Rex says that the entire “universe” has been watching Impact Wrestling. He loves the conflict and competition. He tells EC3 and Galloway that he wants to see their match. He’ll see it up close, as the guest referee. Eli Drake calls Storm a “dummy” for losing the King of the Mountain Title. Lashley walks up and tells Drake that he doesn’t need a catch phrase. Lashey’s going to deal with Drake pretty soon. Matt Hardy asks Jeff what his game plan is. Jeff will use his body as a weapon. Matt says “no.” He says that ladders are obsolete. Matt will delete all the ladders from the ladder match. Not a great match. Drake looked fine, but Shera looked awkward. He paused at strange times and at one point seemed to sell a hit when nothing happened. The finish wasn’t great either. It kind of surprised me just because I didn’t expect the pin to happen after a move like that. Dixie Carter and Billy Corgan approach Bobby Lashley and want to know what his announcement is. Lashley says that he doesn’t have to run anything by them. 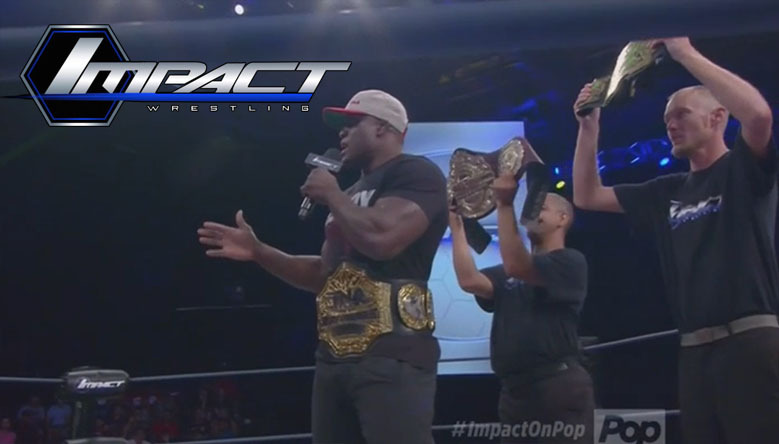 Lashley heads to the ring and calls out Dixie Carter and Billy Corgan. Lashley reminds them that he holds all the power and is a businessman. He wants to unify all of the titles, thereby dissolving the X-Division and King of the Mountain Titles. Corgan reminds Lashley that he’s the new president and that he calls the shots. Lashley throws down the King of the Mountain Title and calls it garbage. He says that he ran through the X-Division, so he throws down that title as well. Dixie Carter doesn’t like that. Lashley doesn’t seem to care and leaves the ring with just the World Title around his waist. Corgan announces that Lashley will have to defend his World Title before Bound for Glory. Again, Lashley doesn’t care. Billy Corgan says that Lashley effectively vacated the X-Division and King of the Mountain titles and that new champs will be crowned. An okay match. It was kind of all over the place. Matt Hardy was the most entertaining even though he barely did anything. There were a few pretty good spots, but it really just felt like a bunch of stuff happening and then it ended. There was no real focus. The show felt disjointed (which makes sense since it was taped over multiple dates), but it was kind of okay. The Lashley thing was sort of interesting, but the way they handled it completely devalued the X-Division and King of the Mountain Titles. Putting all the gold on one person is kind of a no-win situation, but this really was one of the worst ways to get the belts on other people. And the Knockouts Title situation makes no sense. If Gail Kim lost then she wouldn’t ever receive another title shot, but she didn’t lose. I don’t understand why they handled it like this unless there will be more to he story later on. Despite the finish and the craptastic refereeing of Earl Hebner, this was the most put-together match on the show.